The general who didn’t really exist. The emperor who liked to pretend he was a gladiator, and went kind of crazy. Maximus… Maximus… was fictional. No matter how handsome Russell Crowe would lead us to believe he was, he simply did not exist. The naughty emperor, Commodus, however, was all too real, and it’s worth a dig into his story, to see where Gladiator fails the history tests. Ridley Scott’s excellent film, Gladiator (2000), gives us a picture of the Roman empire, at the twilight of the 2nd century, A.D., which is compelling, but a historical fiction. The story follows Decimus Meridius Maximus, a general of Rome, who is executing Emperor Marcus Aurelius’ wars against Germanic peoples with vigor and gusto. When the emperor’s son, Commodus, appears at the front, however, Marcus is murdered, and Maximus is betrayed, to his expected death. Here is where the real story of Commodus first diverges from the fictionalized account, presented in Gladiator. In the film, Commodus murders his father, the wise and capable Marcus Aurelius, in the heat of jealousy, at the news of being passed over for succession to the throne. The histories differ from this plot point, in two ways. The first is that Commodus did not need to murder his father, in order to become emperor—not only did Marcus not name someone else as successor, but, knowing that Commodus needed leadership training, Marcus had already elevated him to the rank of full Augustus(emperor), in 177, and co-ruled with him in the three years before Marcus’ death. Marcus’ death, itself, is the other way that Gladiator fictionalizes Commodus’ actions—Marcus most likely died of natural causes. The agreed-upon story is that Marcus had contracted the plague, probably small pox. His actual death is disputed by the ancient sources, with Cassius Dio claiming that his physicians killed him, as a favor to Commodus (but again, to what benefit? ), and the Historia Augusta accounting that Marcus starved himself. What is not disputed, though, is that he was deathly ill, and the implication is that the disease would have killed him, if a human did not. It’s worth noting that Marcus Aurelius’ armies had kicked the snot out of the German tribes for around 14 years, and barely faced any further resistance to Marcus’ plans to add new provinces to the Roman map, when Marcus died. It is possible that all of the modern maps of the old empire, labeled something like “Roman Empire, at the height of it’s power, during Trajan’s Reign” would have been different, bigger, and would given credit to Marcus Aurelius. It could be possible, that is, except that when Commodus took over, he declined to finish his father’s plans. He did fight one small battle, for show, and then treated for peace, and went home. All this is summed up in the film, very neatly, by a hard cut, from the footage in Germania, to a shot of Rome. As the story progresses, Maximus fights his way up the ranks of slave gladiators, to finally best the evil emperor in a gladiatorial match, on the grand stage of the Colosseum. As he does, the audience does get some very good tastes of Roman culture, eg. the lust for games, the conflict between senate and emperor, and the craziness of the particular emperor Commodus. The Colosseum is perhaps where Gladiator hits most accurately. The Colosseum is perhaps where Gladiator hits most accurately. 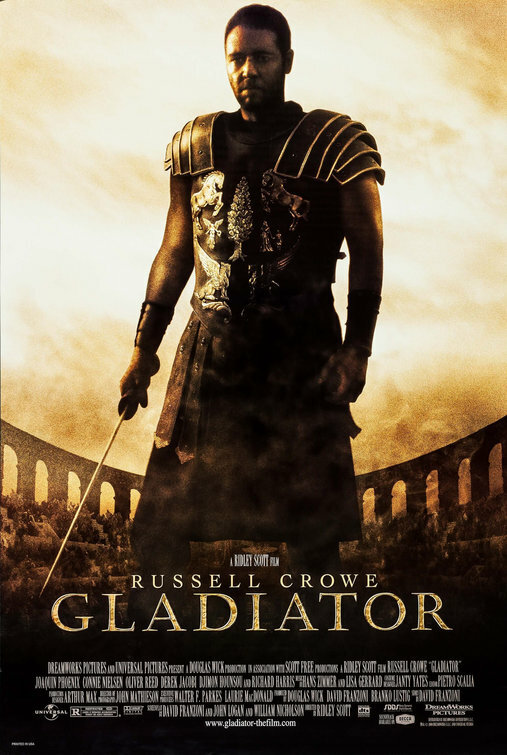 The film shows us not only fights between gladiators, but war chariots, tigers leaping out of trap doors, and elevator systems raising up the floor. The remarkable Colosseum really was this impressive, and Commodus made heavy use of it, much for his own pleasure, but also to win approval of the Roman everyman. Commodus was an enormous fan of the gladiator life, and, just by his self, killed hundreds of gladiators, in totally-rigged fights. He also rounded up exotic animals from the far reaches of the vast empire, and then killed them, too. Cassius Dio tells us that Commodus hunted “five hippopotami together with two elephants on two successive days; and he also killed rhinoceroses and a camelopard.” Always with the camelopards, that Commodus. At least at the beginning of his reign, his heavy booking of the Colosseum made Commodus very popular with the Romans, who did not have many options, for sports to follow. While Commodus spends his days fighting and ‘hunting’, however, there is back-room dealing and scheming, to the end of overthrowing him, and restoring the senate. His sister, Lucilla, and a few senators are the centers of said dealing and scheming, and this is both historically accurate, and misleading. Commodus’ older sister, Lucilla, is also a real historical figure, and is also fictionalized, in this movie. She did, indeed, plot against Commodus’ life, and the plot did, indeed fail. Commodus probably did have unbrotherly feelings for her, as the Historia Augusta claims he did, for all of his sisters (the phrased used, in this particular translation, is that Commodus had “debauched his other sisters”). As for Lucilla, her treasonous plotting earned her an exile, to Capri, and then an execution. Less fictionalized is the Roman Senate. The film presents the Senate, as represented by Gracchus, as being marginalized and yearning for a return to relevance, and this is could be said very accurately about the Senate, of this period. This honestly could be said about the Senate, at most any point, from 27 B.C. until the end of their existence. After all, Julius Caesar was stabbed to death for acting as king, where the Senate had been the sole governing body, for centuries. When Augustus finally cemented the position of a single Emperor, he did so by first killing off all of his political opponents, and then balancing his rule between singular authority and deference to the Senate. After him, there were emperors who were not so respectful, but Commodus was one of the worst, humiliating and killing off people of influence, and replacing them with his own people. The 100 years of kind treatment by Nerva, Trajan, Hadrian, Antoninus Pius and Marcus Aurelius could only have made Commodus seem more evil. It is scarcely a wonder that they tried to kill him, on multiple occasions. As if they didn’t have enough reason, Commodus’ behavior began appearing more and more insane. At first, it was simply drinking, debauchery, and obsession with gladiators. He left the actual administration of the empire to his cronies (and said cronies would fight it out, amongst themselves, for this real power). So, having divested himself of real responsibilities, Commodus basically lived a rock-n-roll lifestyle. After a botched assassination attempt, though, Commodus’ behavior turned. He began to confine himself to the palace, except when fighting in the Colosseum. This lifestyle seems to have solidified in Commodus’ head, and he began to consider himself not just as a rockstar, but as a god. He would appear actually dressed as an ancient Greek god, even carrying a huge club, and calling himself Hercules. His insanity must have reached the masses, finally, when he declared that all of the months of the year would be renamed as some variation of his own name, and even Rome, itself, would be renamed “Commodiana”. By this point, the entire empire would have seen the need to be rid of him. In the end, the fiction of Gladiator is not the true story of Commodus, perhaps simply because the real story does not end well. For the Romans, there is comparatively little glory, from here on out, except for the brilliant reigns of Aurelian, Diocletian, Constantine, and perhaps a handful of others. The senate will be more and more starved for power, while some emperors will be lazy, incompetent, cruel, or insane. Maybe the best bit of news, for the Romans, is that none of those emperors would be all of those things, at once. At least, not like Commodus, the great and terrible, the cruel and totally insane.